Two summers ago Adam found a little cacti growing kit at Walgreens, we bought one and he started them right away. It was so cute to watch them grow because I’ve never seen cacti grow from seeds before. That, and the kit’s seeds were a mix of different cacti so it was cool to see which kind grew. Once they outgrew the starting container we transferred them into Dixie cups as a temporary home but we ended up keeping them in the cups longer than intended. Now the cacti are much bigger and in need of a new (more permanent) home / repotting. We knew the cacti really needed to be repotted so I had done some research and found out that cacti do best when planted in shallow wide containers instead of tall containers. The shallow dirt allows for faster drainage, thus a lower chance of root rot. I knew I wanted something simple that wasn’t going to be super expensive so we went to our local Salvation Army and got a set of two white bowls for only $1.20. I would have called it a day there but I wasn’t a huge fan of the grey stripe around the rim because it made it more obvious that it was a cereal bowl and looked less like a planter. So my brother spray painted them white with an enamel spray paint and they turned out lovely! Call me crazy for taking a white bowl and painting it white-er but I love the simplistic look. We didn’t drill any drainage holes in the bowls so after they finished drying I filled them with some small stones. We’ve done this before with a snake plant we have that’s in a container without a drainage hole and it’s doing wonderfully. You just have to be careful about watering. Next I added some cactus soil, the cacti, and more soil to top them off. I loved growing these so much I'm tempted to get another kit or maybe just buy some seeds of a mixed variety. In our experience they sprouted fairly quickly and were really fun to grow. The cactus kit would be especially great for kids to watch grow, then have the fun experience of repotting them. We actually had two other dixie cups with cacti in them. 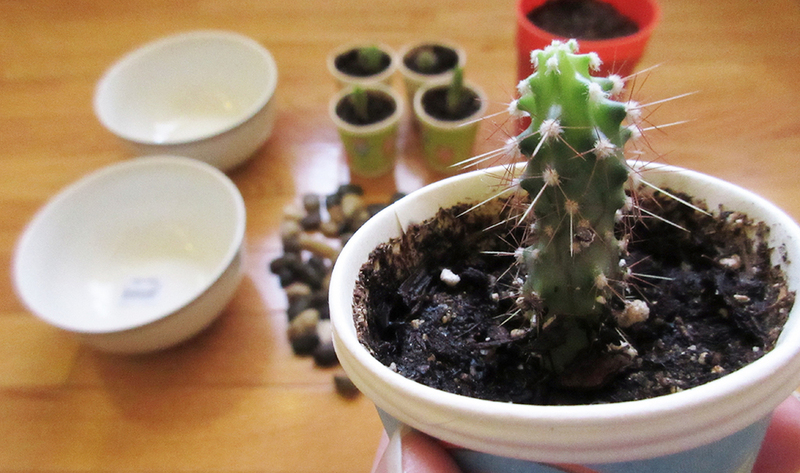 One was a single cacti in the cup and the other was a cluster of three but both went outside and didn't fair well. I’m really happy with how they turned out and that they’ve finally been repotted. Do you have any spring-time gardening you’ve been up to? Any repotting that needs to be done? I hope you have a great day! See you on Friday for a BBQ related post!